Whatsapp is improving its Features day by day , as last week whatsapp introduced Delete For Everyone Feature which enables users to delete a message sent by mistake to Group or a chat in which they don't want to send and two weeks ago whatsapp introduced Live Location Sharing Feature . Now whatsapp introduced in chat payment feature which is known as " Whatsapp Pay " . 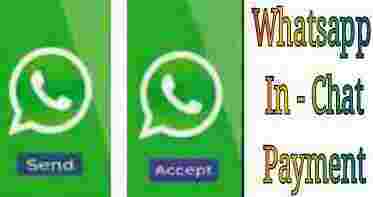 Whatsapp Pay allow users to make transaction with their contacts directly from the whatsapp . Users would be able to send money to their contact or recieve money from their contact . Whatsapp announced about this feature two months ago at that time whatsapp announced that whatsapp is integrating UPI on its application through which whatsapp users would be able to transfer money through UPI Interface by using whatsapp . According to current report whatsapp has partnered with the largest three banks of India , these banks are State Bank of India, ICICI Bank and HDFC Bank, to make whatsapp pay feature most comfortably and users would be able to make transaction directly through these banks . As while announcing last time about whatsapp payment method whatsapp was working on this and till now whatsapp was testing this feature . Now whatsapp Pay is in its final testing phase . It is expected that the whatsapp will launch a beta version whatsapp with whatsapp pay feature in early November after completion of beta testing of this whatsapp will roll out this feature for all the users those are using whatsapp . It is also expecting that whatsapp will roll out whatsapp pay for all whatsapp users on December . How Whatsapp Payment Feature Will Work ? This feature will work in similar manner as users shares the live location , contact and media files like image , video , gif or any documents through whatsapp and you will not have to leave your chat interface . Once the whatsapp payment feature roll out for all users a new indian rupee icon will appear on attachment icon as live location sharing , gallery icons already appearing here . When users will tap on rupee icon , whatsapp will ask about the amount you want to transfer and the personal identified no. of receiver who will recieve the money , then you will have to fill code or pin to confirm the transaction and press the send button . After completion of this process the users for which you send the money will recieve notification similarly to new message with accept or reject option.The receiver will then have an option to either accept or reject the payment. Note :- Currently there are no.official announcement made by whatsapp payment feature . After rolling out this feature there may Difference from procedure mentioned above.